Beautiful home on 102 acres with gorgeous views and top notch bird watching! 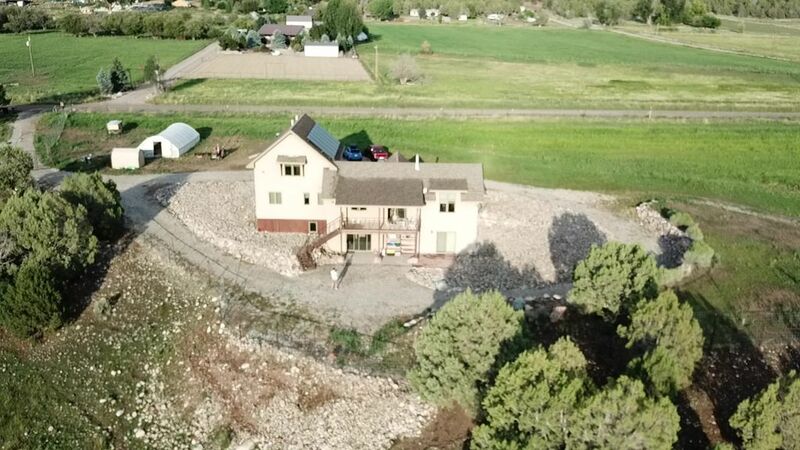 This beautiful 2500 square foot home sits on 105 acres of a certified organic farm situated in the Animas valley just a short distance from the Animas river. It's located South of Durango about 12 miles from downtown and 8.5 miles from the NM state line, but don't let the distance from town deter you, because it's well worth the drive with the picturesque views, and top notch bird watching. There is a pond, which includes a wildlife conservancy easement protecting the beautiful open space . Enjoy sitting on the deck with views of the La Plata and San Juan Mountains, and enjoying watching the pond with rare birds and wildlife visiting all year long. Bring your binoculars, so you can watch the bald eagles in their large nest right next door. They're seasonal guests that return every year in the late summer/fall, and stay through spring. The upstairs includes a master bedroom with queen bed, large bathroom with antique tub and walk in shower along with a huge closet. The main floor has 2 bedrooms with a queen bed in each room, One and a half baths, full kitchen with large island, large dining room table, living area, sofa sleeper, cozy wood burning stove, and deck with beautiful views of the sunset over the mountains. The basement includes a professional kitchen, and yoga room complete with sound system and cork floors! The basement can be rented out separately, or as a package deal. A private, or group yoga instructor can be included, as well as energy healing sessions. The home is complete with wifi, radiant floor heating, and all the amenities you will need for an enjoyable and relaxing stay. Whether you are looking for a relaxing stay, business trip meeting space, wildlife birding preserve, or yoga/healing retreat this is surely the place for you. You will want to bring; binoculars, sunglasses, sunscreen, hiking shoes, and groceries. We can fully stock the fridge for an additional charge. All Organic cleaning supplies and bath products are used. Large master bath on top floor with antique tub, walk in shower, dual sinks, and walk in closet. One full bath on main floor with shower/tub combo, and half bath on main floor with toilet and sink. Large dining room table with seating for 8. There's also bar seating for 4 at the large island in the open kitchen.